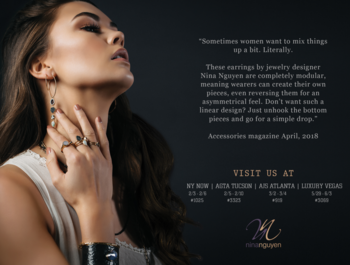 Nina Nguyen, owner of Nina Nguyen Designs, is pleased to announce that her company will be joining IJO as a new supplier member. Nguyen, whose signature style has made her a global name in jewelry designs, is thrilled to be joining the prestigious group. "We are excited and proud to be a part of the IJO family, which represents integrity, quality and trust." said Nguyen. "We look forward to building genuine relationships and life-long partnerships with fellow members." Her innovative, patent pending design covers an element in the Nina Nguyen earring collection, which allows pieces to be transformed for multiple-use, convertible styling. Earrings featured in the collection can individually be turned into a pendant and worn on a necklace or used as a charm for the Nina Nguyen wraps. The socially-conscious Nguyen is one of only a few designers who exclusively uses recycled gold for her 18K pieces as well as recycled diamonds for her new designs. Nguyen puts an emphasis on gold in the more than 700 skuâ€™s featured in her latest collection, but sterling silver, as well as black oxidized silver and some vermeil still play a big part in her overall design offerings. The hand-hammered, textured finish she developed is also featured, and lends a unique and brilliant touch into the pieces it is used.